The Organization of Islamic Cooperation (OIC) declared East Jerusalem the capital of Palestine "under occupation" and urged the U.S. to withdraw from the peace process and back down from its Jerusalem decision in a statement issued following an extraordinary summit in Istanbul on Wednesday. The OIC also called on other countries to recognize East Jerusalem as the Palestinian capital. Following the summit, President Recep Tayyip Erdoğan, Palestinian President Mahmoud Abbas and OIC Secretary General Dr. Yousef bin Ahmad Al-Othaimeen held a joint press conference to announce its results. Abbas said that Palestinians can no longer accept the U.S. as mediator in the peace process since it has lost impartiality. "We will aply to the UN Security Council for the annulment of US decision to recognize Jerusalem as Israel's capital," Abbas said, noting that all 14 member countries of the UNSC other than the U.S. support Palestine's position. As the final leader speaking in the summit, Erdoğan bitterly criticized the U.S. and Israel for reckless decisions placing themselves above the international law. "I believe that with this historic summit we have shown the world that Jerusalem is not abandoned," Erdoğan said and thanked all leaders for convening in such a short notice. "I think this portrait of unity on Jerusalem should set an example, lesson and warning for everyone," he added. 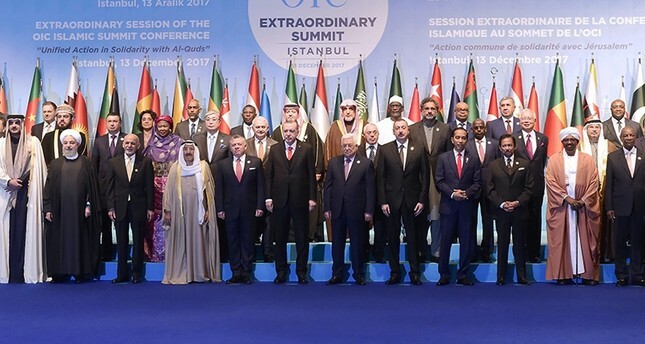 Invited by Erdoğan, leaders and representatives of 57 Muslim countries gathered in Istanbul in response to last week's U.S. recognition of Jerusalem as the capital of Israel, a decision believed to be pushed by President Donald Trump. "Trump, do you stand behind this Israel? There is occupation, torture, terror there. Do you defend this Israel? But I find it normal since the [same] Trump mentality that used terrorist YPG/PYD against Daesh also does this," said Erdoğan while condemning Israeli security forces for the violence against protesters. Erdoğan once again urged all countries which have not already done so to recognize the State of Palestine with Jerusalem as its capital. Trump's announcement drew widespread international rejection and condemnation and sparked a wave of protests across the Muslim world. Tension has particularly mounted in the Palestinian territories. Israeli security forces have so far killed two Palestinians and injured several hundred during demonstrations against the declaration. Jerusalem remains at the heart of the Israel-Palestine conflict, with Palestinians hoping that East Jerusalem — illegally occupied by Israel since 1967 — might eventually serve as the capital of a Palestinian state. 23. Assert the need to continue to follow developments in this regard and to take the necessary action accordingly.